Those of you who have followed my blog for awhile know that my Frugal Fashionista series contains designer outfits on a thrift store budget. How does that fit into 31 Days of More to Less? Considering my fashionista wardrobe consists of only 10% new items and 90% “new to me,” I think that is self explanatory. Finding core wardrobe pieces second hand is much easier than you imagine. I encourage other to save money by buying some of those items second hand, but then buy accessories and statement pieces new so that your wardrobe is continually kept up to date. Two of my “wish” list items for my fall wardrobe were statement pieces that would be hard to find second hand. I kept my eyes out all summer long at yard sales and thrift stores with my eagle eyes, but have never hit the jackpot. I have a lot of patience when I thrift, and am willing to wait, but I finally knew that I was going to have to splurge and actually buy them new. Since my $1 yard sale, long black Gap sweater from a few years ago is finally showing its age, I knew I wanted to replace it. It is definitely my “go to” item all winter long. In my opinions, long cardigans are a fashion “must have” for all wardrobes. They are perfect for accessorizing and layering, which is very hot in the fashion world right now, but more importantly, they cover up that muffin top that tends to be exposed. (I’m still trying to work that off with my 30 Day Shred, but whew, it’s taking longer than thirty days. ;)) Honestly, long cardigan are incredibly flattering on nearly all body types. On sweaters and longer shirts,the asymmetrical hem is all the rage right now. I’ve been looking at all the vast choices for the last few months, and the styles are endless with tons of colors, hemlines, and styles. I attended TJ Maxx’s Behind the Seams event where they talked about all the new fall fashion trends. When I shop retail for my husband and kids, I hit up TJ Maxx because the feel is similar to when I am thrifting…it’s all about the thrill of the hunt. They also offer designer outfits at slashed prices. I’ve been holding onto my gift card way back from my Back to School Giveaway in August (I know, I’m crazy like that), and knew I wanted one of my purchases to be a long asymmetrical sweater. I only had about fifteen minutes to shop, so I snapped a few pictures (above and below) to show you my choices. (Do you see my silver necklaces? I’ve been doing a lot of layering with the jewelry I already own for an extra punch of pizazz. Try it. It’s using what you already own for not only extra dimension, but that boosts the wallet power at the same time). There were so many choices, and I didn’t even get around to trying on about five more styles they offered because I stopped immediately when I got to their clearance rack and saw the bright orange sticker that said $15. I’m not going to lie and tell you that I haven’t fallen in love with a few styles on-line (but not pictured) that ranged from $78-$128, but $15 falls in the “It doesn’t have to be perfect to be beautiful” department. This light cotton is perfect nearly year round in NC, but I will be looking for another heavier one to wear as a “coat.” For those of you who are intrigued with my Frugal Fashionista series, but haven’t jumped on the bandwagon, this should be a more manageable way for you to ease into the best of both worlds scenario. 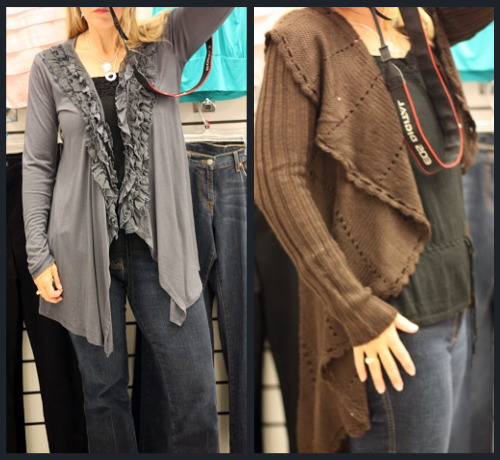 In the stores, I paired all the new TJ Maxx sweaters with my $1 Gap jeans, and $1 Anne Taylor Loft black sleeveless sweater for a fabulous look. I’ve already worn this shirt/sweater with so many things. It’s great for a casual look like over this tank, or it’s so easy to dress it up over a skirt or little black dress with great accessories. I’m debating getting a few more because I definitely think I could live in this look all winter long. I love this time of the year and can’t wait to pull out all of my sweaters. Remember, when you don’t know what to wear, first shop your closet, then look to add some core wardrobe pieces (that you really can find second hand), and lastly, add some statement pieces to jazz up your fall wardrobe. You look so great!! I LOVE my long sweater that I got last year and I wish I had 5 of them 🙂 Now I need an angle one for sure. This article was perfect for me. I love to shop and getting new pieces. The thrift stores here are really not that organized and I lost my patience. I have fallen in LOVE with Marshalls, TJ Maxx and Ross. I feel like I’m still getting the style just has a fraction of the price. Now being unemployed and having no income I feel guilty for even buying a pair of jeans that I needed desperately, but buying them thrift was the best thing I could have done! I just bought a grey asymmetrical cardigan at TJ Maxx today! LOL! Ummm… you have occasion to wear sweaters in NC already? I may need to beef up my winter-wear before moving. I hope there are some good thrift stores in the Raleigh area now that summer yard sale season has ended! Just wanted to make you aware of the typo in your page title. It is says, “The Assymetical Sweater: Frugal Fashionista.” I guess it is called a page title. It is the words that appear on the tab when the page is open. Love your bargains! That sweater will get a lot of use, I am sure. You would have loved the finds at Goodwill that I got over fall break. My in-laws live in a very wealthy area in GA and a new Goodwill just opened up. I found some of the cutest tops you have ever seen! My MIL couldn’t believe it. They were all designer brands and looked brand new. I have a new shirt to wear everyday this week for around $15.00! Thanks for all the great tips! My closet has improved incredibly just from reading your posts, in fact the family asks, “where you going mom?” whenever I’m wearing one of my frugalista outfits. I’m enjoying dressing “up” for my family! Cute, cute, cute!!! I cannot find such things around here. I don’t know if I just don’t have the time to search them out or if my area just doesn’t have cute stuff around! I still have 15 pounds of baby weight to come off (and it is taking it’s sweet time) so I’d love a long sweater. I didn’t want to buy new pants because I was hoping to be back in my old one’s by now, but I may have to move beyond the stretchy Target pants and the one “regular” looking pair of maternity jeans. Just one good pair of jeans and a long sweater would be a good option until I can get in my old pants! Hey Jen! These outfits are adorable! 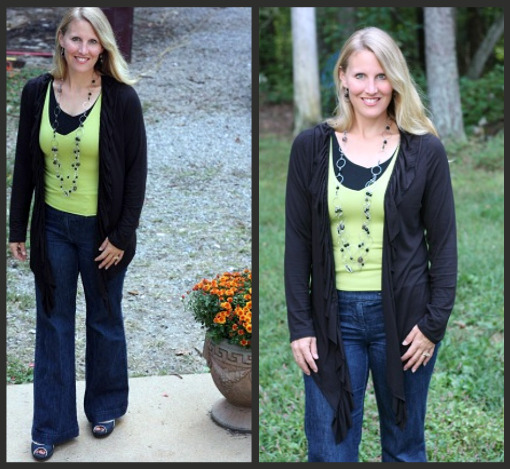 Fall is my favorite fashion season and cardigans are an asset to any wardrobe. I love the selection you have going on here. Your pics are fabulous. I live in a smaller town and my Goodwill doesn’t always have great things- but I’ve discovered many consignment stores in my area! @Jens, I love watching your videos, but I see the October 8th post about cleaning the stainless steel fridge, then the next post that comes up on my computer is this one. Could you tell me where the video is or share a link, please! I JUST switched the video one down on the screen. It was first at the top until this afternoon. That’s probably why you couldn’t see it. I love long cardigans. Even though I’m not tall, with a little heel I can get away with it. They’re just so cosy in the winter. 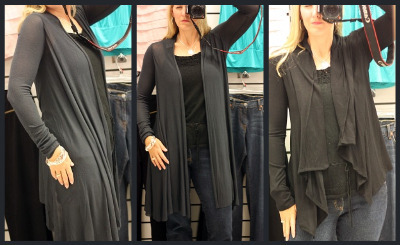 Living in a colder climate, I have also been looking for a long cardigan–but a cozy, preferably hooded, one! I haven’t had any luck at the thrift stores, even though I looked all summer, so I have just about decided to buy retail (very rare for me). I think I will check TJ Maxx–thanks! I usually have great luck finding accessories secondhand, by the way. I have found many beautiful silk scarves, shawls, and belts at my favorite thrift store. Just last week, I picked up a 1950s-vintage faceted crystal choker–the kind that sells for $20+ on ebay–for 50 cents; it was mixed in with the Halloween costume jewelry. Fun! It’s all there for those who take the time to dig . . .
You KNOW I’m with you on this one! Thrifting, yard sales and hand-me-downs keep our clothing budget to almost nothing when it needs to be. I think undergarments are the only things I buy new anymore! Oh, and swimsuits as there aren’t enough beaches/pools around that people buy and donate many. Cute sweater! I love the grey one on you, too. How much was that one? My big sis gave me a bunch of designer/name brand sweaters over the summer and I’m so anxious to wear them. None are long, asymmetrical (wow, that’s a tough word to spell) ones though. I wore some of the lighter ones, but the heavier ones will have to wait until the snow flies soon here in CNY. On my frugal fashionista wishlist – a vintage (or vintage inspired) cloche hat, flapper style dress and high heel oxfords. OK, what do I do if I’m hard to fit? The only items I can find at steal-me prices are boring, like Ts – and it makes it hard to thrift! Advice? Well, a great Tshirt under this $15 long cardigan may not be a steal me price, but still a great frugal fashionista option. 🙂 Move to NC and I’ll find you some great steals…even thrifting. 🙂 Seriously, TJ MAXX has an awesome clearance section. One of my coworkers at the part-time job told me I was dressing “spiffy”. I took that as a compliment, but didn’t tell her that I’ve been following your advice. Because, she would ‘never’ shop second hand, at least that’s what she’s said. Too bad for her; great for us Frugal Fashionista gals, huh? 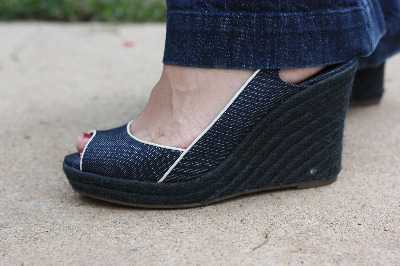 I think I like your Frugal Fashionista posts so much just because we get to see pictures of you! You are so photogenic! I think I’ve told you that more than once my husband has come up when I’ve had your blog page up on the screen and said, “She’s really pretty!” And you are. Inside and out. Hasn’t this October weather been glorious?! You can actually wear a sweater! Woo hoo! I have a couple of those type sweaters in my closet too, they are great! Love the pictures, thanks! I love the sweater. It is super cute! You are absolutely beautiful, and I love that you are showing women how to dress fabulously for next to nothing. I always say you don’t have to spend a million bucks to look like a million bucks! And my girlfriends favorite saying is don’t leave home without your best accessory-your smile! My fall find would be a tall pair of black flat boots that dont break the bank.. My three current pairs are on their last legs-they’ve been loved…a lot! Keep up the great work! You have a great sense of style!